Call for Proposals and Reviewers Now Open! The Canadian Association of College and University Student Services (CACUSS) is proud to partner with Mount Royal University for the 2019 CACUSS Conference! The learning that will occur at MOH-KINS-TSIS 2019 and beyond will be enriched by the exchange of insights and perspectives of our conference delegates – and the invitation for you to enliven that exchange as a program presenter is open until Friday, January 11, 2019. The Conference Program Committee and our host, Mount Royal University, encourage you to submit a program proposal for MOH-KINS-TSIS taking place June 16 – June 19, 2019 in Calgary, Alberta. CLICK HERE for more information about the diverse range of session formats we encourage you to consider for 2019. CLICK HERE to access the review rubric to ensure your program content and description meet the criteria. CACUSS proposals will be evaluated based on identified learning outcomes that integrate the CACUSS Competency Model, in addition to the proposal’s delivery, evidence, ideas and learning outcomes. Consider participating in one of our Conference Streams this year. These sessions present opportunities to share research, programs, or initiatives through an oral and visual medium and engage colleagues in an interactive experience. Presentations may include experiential learning activities, dialogue related to current events, developing trends, research, divisional or regional issues, best practices, and/or personal and professional development. Creative and innovative presentation formats are encouraged. Concurrent sessions take place between Monday, June 17, 2019 and Wednesday, June 19, 2019. Posters afford an opportunity to display research, programs, or initiatives through a visual medium and engage colleagues in one-on-one dialogue. The poster should be designed to present information in a visual format that is easy to digest and that stimulates thought and further exploration. Presenter(s) should be available to present their poster presentation on Monday, June 17, 2019 and posters will remain in the showcase until end of the day on Tuesday, June 18, 2019. Big Ideas is powered by PechaKucha, a unique presentation format during which the speaker’s 20 slides auto-advance every 20 seconds. 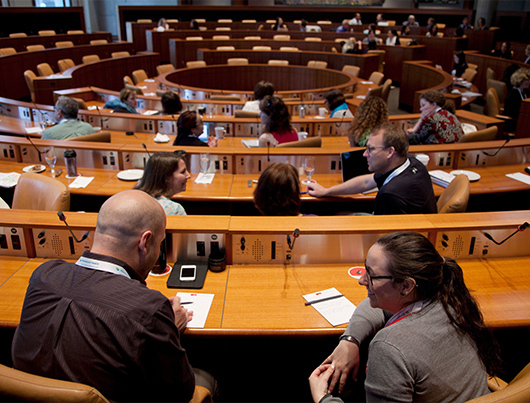 This creates a dynamic presentation that explores different aspects of the conference theme in an innovative way from a variety of voices within the Canadian student affairs profession. Big Ideas: Powered by PechaKucha sessions will take place as a featured morning plenary session on Tuesday, June 18, 2019. Submit your conference proposal (Poster Session, Big Ideas or 45/60/120 minute session) by Monday, December 31ST 2018 at 5:00PM PST and be entered to WIN an Air Canada economy class ticket valid for travel within Canada! The Call for Proposals closes FRIDAY, JANUARY 11TH, 2019. CLICK HERE for more information or to submit your proposal today! At this time, we are also seeking volunteers to serve as program reviewers. We anticipate that each reviewer will be responsible for 5-10 anonymized proposals. Proposals will each be reviewed three times. You will receive proposals by Monday, January 21, 2019. Your completed reviews will be due Monday, February 4, 2019. The anticipated time commitment is 5 hours. If you can serve as a reviewer, please complete the form here using sign up code CACUSS19 by Friday, December 21, 2018. If you have additional questions, please email events@cacuss.ca. The success of MOH-KINS-TSIS depends on the active engagement and enthusiasm of CACUSS members. We look forward to receiving your proposal and/or reviewer applications – and to seeing you in Calgary! © 2019 Canadian Association of College & University Student Services.